THE GAMES: The sky is the limit for Australian triathlete Matthew Hauser after he finished fourth in an exhilarating Commonwealth Games debut. Jacob Birtwhistle produced a Herculean performance in the run, in which he came from 28 seconds down at the final transition to claim Australia's first medal of the Games seven seconds behind South Africa's Henri Shoeman (52mins 31sec). The South African dominated. He was in the lead group after the swim and maintained his place in the six-strong pack on the bike. 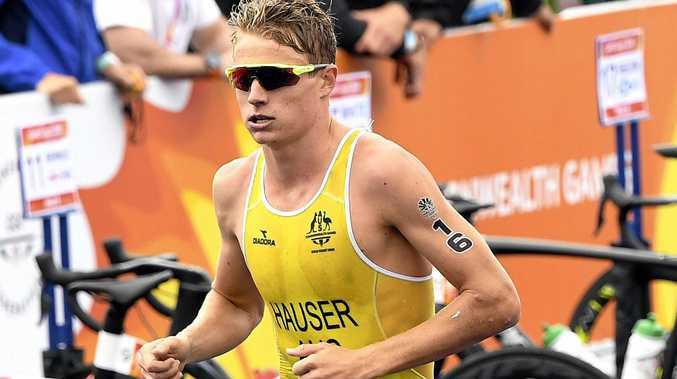 Among that group was Gold Coast-based, Hervey Bay product Hauser, who stayed with the leaders throughout and finished just two seconds behind Scotland's bronze medallist, Marc Austin. But there was no disappointment at missing out on a medal in Hauser's voice after the race. The young gun did what did best, and enjoys most, when he was on the track. "Coming down that home stretch with the crowd yelling it was deafening. It made me lift to another level, I almost got to third but I'm stoked with fourth,” he told Channel 7 in his post-race interview. The 20-year-old who has enjoyed a meteoric rise in the past year. After a junior career that included four School Sport Australia triathlon championships, four straight Oceania Championships and two Australian Junior Triathlon Series titles, he made his World Triathlon Series debut on April 7, 2017. He won the 2017 Chengdu ITU Triathlon World Cup in May, was part of the first Australian team to win a world mixed relay gold medal in Hamburg, Germany, in July, then won the World Junior Championship at Rotterdam, Netherlands, in September. He has remained grounded throughout the entire process: he has never let his on-track success influence the person he is. It was on display moments after the race, as a clearly jubilant Hauser high-fived volunteers and took photos with young fans. Hauser is likely to compete in Saturday's mixed relay, exactly 12 months after the WTS debut that started his path to the Gold Coast Games.